A former republican prisoner rang me this morning. He sounded angry and gave out about ‘those bastards’ having followed him into the school grounds where he was leaving his daughter off for her day’s lessons. Which set of bastards I asked him given that quite a few sets had hassled him over the years for his views. ‘The cops’, he said in exasperation. He has been the subject of cop attention for decades. When he is not in prison the cops seem to spend their time trying to give him extended B & B courtesy of Her Majesty. On this particular occasion his ire was raised because he was with his daughter. The cops stopped him in the school grounds and announced that he was subject to Section 44. It is the technical official term given to harassment. In their former guise as the RUC they had something similar which they would rattle out before beginning their search. They don’t suspect the person they approach of having anything in their possession. It is just a chance to demonstrate police power over republicans. It is a statement from the cops to republicans that if they continue with their republicanism they will be hassled and harried at every opportunity; normal life isn’t something republicans will be allowed to get on with. Earlier in the week the same former prisoner had been visiting the grave of his parents. The PSNI: bounced over the graves and through the headstones to me and gave me another Section 44. I told them they were messing about. They knew I was merely visiting a grave. They ignored me and went through the same procedure of searching me. Total messing about. Baggott is pushing his weight around. There has been a noticeable increase in police targeting of republicans for intensified harassment. A member of the Republican Network for Unity was arrested at Belfast International Airport returning from a Network event in Glasgow. This came some months after the PSNI had falsely briefed journalists that the same man was the leader of the Real IRA in Belfast. IRSP members leaving the the party’s Belfast office had their car surrounded by gun toting and screaming PSNI members. Police aggression was so pronounced that one of the IRSP members told me he thought he was going to be shot. A female member of the Irish Republican Prisoners Welfare Association was arrested at her home and detained overnight at a PSNI interrogation centre. Whispers have been making their way to the press that many arrested republicans are being questioned about the Real IRA attack on Massereene Barracks which left two British soldiers dead in March. While some republicans certainly shot up Massereene, they all can’t have done it. The PSNI in trying to tie all forms of republican activity to attacks on Massereene is on a rerun of the old post-August 1998 position where all republicans at odds with the Good Friday Agreement were depicted as Omagh bombers. Police harassment is still a fact of life on the streets of working class communities. It is as much political in application as it is security driven. That it is no longer as rampant as it once was is simply because of the reduced level of political violence emanating from republican quarters. A reduction in police activity in such circumstances is hardly a reduction in police powers. 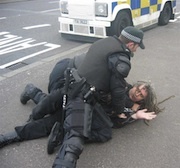 In some areas the PSNI has more powers against citizens than it ever had while called the RUC. It is clear that the approach of the latest British chief constable is to demonstrate most fervently that for him the police is a force not a service.